When it’s time to update your building’s railings, it’s good to know the best practices for railing replacements. We’ve put together this resource as a go-to for condominium associations, so that your board can go into the process armed with knowledge. If you’re already here reading this, then you may be dealing with a railing system failure. If so, you want to make sure that your new railing replacement doesn’t fall victim to the same issues that caused you to need to replace the rail in the first place. Poma Pin: Watch the video to learn how to install the best guardrail systems for condominiums. Learn more about the Poma Pin. The installation system by which the railing post is attached is crucial to the long-term performance of the railings themselves. 90% of guardrail problems occur in the bottom 6 inches of the system. A good system will control moisture, prevent corrosion, and protect the building’s concrete balcony slab. The big takeaway from this article is that the guardrail itself is relatively simple. But how it connects to the concrete balcony is both an art and a science. Condominium balconies for Marbella Boca Raton during and after railing replacement. In this article, we’ve identified the best practices for condo railing replacement, and what condo associations should be looking at before selecting a railing supplier. This resource is based on an article by Poma consultant Dennis Hill entitled “Railing Replacement: Avoid Costly Repairs,” originally written for the Florida Community Association Journal. The pictures tell the story. Ugly rust stains drip over the concrete balcony. Cracked, broken concrete and corroded railing posts indicate that it might be time for a railing replacement. You will en oftsee these railing failures on most coastal buildings, especially on Florida’s 1,197 miles of coastline. This year, Florida condo associations will spend spend an estimated 1.2 billion dollars on concrete restoration. And this figure doesn’t even include the railing replacement. Concrete spalling will require both railing replacement as well as concrete repair. For a number of reasons, condominium associations in Florida may find themselves compelled to replace these railings. 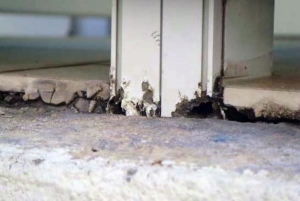 Tenants don’t want to look at unsightly stains and corroding posts on their balconies. They want a guardrail which enhances rather than detracts from their view. And most importantly, the safety and longevity of the railing plays an outsize role. You want a railing system that will prolong the life of your building and keep tenants happy. A good railing modernization can accomplish all of these goals. Many factors contribute to concrete deterioration. These symptoms may be caused by more than one mechanism. 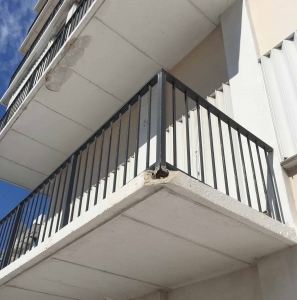 However, in the majority of restoration projects the railings are a major contributing factor in the failure of concrete balconies. Until recently, only two methods existed for attaching railing posts to concrete slabs: (1) Plate-mounted railings with screws into the concrete or (2) Embedded post-railings with core drilling a 3 ½-4” hole in the slab and embedding the aluminum post directly into the concrete using grout. Each of these methods has a number of issues, and should be avoided at all costs. These installations are still prevalent today, even though there have been many studies detailing how and why they fail. Plate-mounted attachments use a plate or cap for the post drilled directly into the concrete. The plate method eats balcony space and diminishes its aesthetic. Many balconies are tiled or feature an elegant floor. Serious problems arise when installers fail to waterproof the anchoring holes or use corrosion-prone hardware. Improper waterproofing allows chloride-laden water to seep into the concrete, corroding the rebar and causing it to expand. Plate-mounted railings bring unwanted moisture into the concrete below. This sets in motion a process known as spalling, whereby the expansion of the rebar up to ten times its original size causes the concrete to blow out (read our resource on balcony spalling causes and prevention for more information on this condition). When concrete begins to spall, hairline cracks will appear in the concrete. This in turn brings more water into the concrete, and the problem worsens over time. Incompatible hardware, including carbon-rich stainless steel screws, causes elecrolysis, corrosion of the aluminum post, and potentially dangerous spalling of the concrete. Concrete and aluminum don’t mix. This failing railing post will require railing replacement. Most railings are typically painted and coated. While this provides some protection, the aluminum mounting plate is in direct contact with the concrete. The concrete’s alkalinity attacks the finish, leaving the aluminum unprotected. This results in corrosion of the plate/post and paint delamination. The second installation method, and probably the most common, is the embedded post. Frank Poma discusses this problematic railing design in great detail in his post on corrosion-free railings. Installers core-drill a 4-inch-wide hole. They then embed the railing post directly into the concrete. Because such a wide hole is required, this method often cuts into the reinforcing steel within the balcony’s concrete slab. This, along with improper grout material may permit separation between the grout and concrete allowing water intrusion to the rebar, producing spalling. The railings loosen and fail and the concrete spalls and cracks. This spells big problems for your building. Balcony railing failures are not only an eyesore. They are a dangerous liability. Additionally, excessive alkalinity of the grout corrodes the embedded post. A combination of salt spray and condensation may build up within the post. The post serves as a conduit into the center of the concrete, causing corrosion. At this point, electrolysis begins. In this condition, electric currents are passing to and from the concrete and steel. This sets up a corrosive reaction which will rapidly deteriorate both the metal and the concrete. When concrete starts to deteriorate, it’s not just an eyesore — it’s dangerous. Building residents are at risk of injury and pedestrians below are at risk of falling debris. This is a liability that no one wants. The best solutions for railing replacement start with having an architect or engineer come visit your building. A certified engineer will survey the building’s balconies to determine if they’re structurally sound. They should be looking at the balcony’s underlying concrete status, the steel reenforcement, and the guardrail stability. The engineer may require a core-sample, which can be completed by a local contractor. When it comes time to select a railing replacement manufacturer for your condo, you’ll want to take a close look at how the system controls moisture. The system should have designated channels to exit the system. Many low-budget railing suppliers will just embed the post in your balcony and drill a weephole in its side. This is going to result in long-term problems listed above. 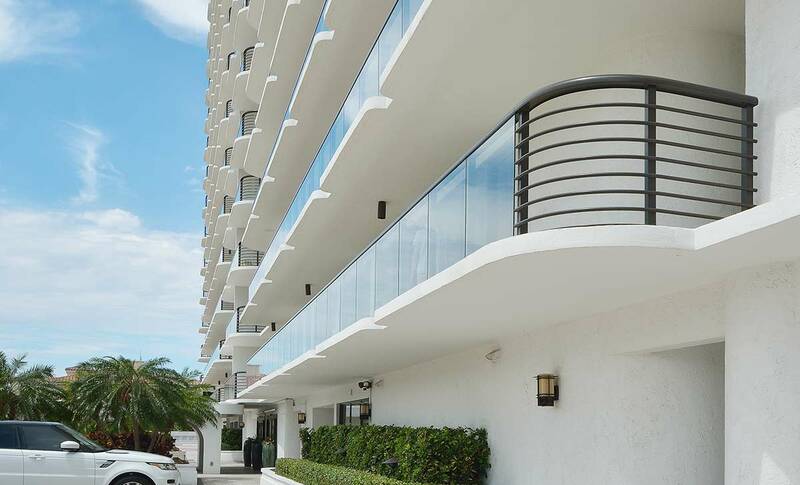 Marbella Condominiums, a railing replacement and modernization project completed by Poma. “Our system has been successful because it eliminates railings as a cause for potential structural damage and costly repairs in the future. Once community and condominium associations see the costs of restoration and railing replacement now, and they don’t want to have to do it again.” — Frank Poma, President. Over the past 40 years, Poma has developed a number of solutions for railing replacement. Many of these systems have become adopted as standards in the railing industry. Today, Poma uses a patented system with a carbon free stainless steel pin that is inserted into the railing post and set into the concrete with epoxy. The epoxy waterproofs the hole, bonds to the concrete, and is electrically non-conductive preventing electrolysis between the aluminum and the reinforcing steel. The advantages of Poma’s system: a smaller 2″ core drilled hole; the absence of any contact between the aluminum with any cementitious material or steel; and a stainless steel pin that will never rust. The system features a built-in channel for exiting water and is engineered for coastal and high-wind environments. What Should I look for in the Best Railing Supplier? Let’s recap some of the larger points made in this article. When it comes to railing, condo associations should look beyond function and aesthetics of the rail design. Consider also the anchor system and how it will combat corrosion and spalling. How does the rail anchoring system protect the concrete? 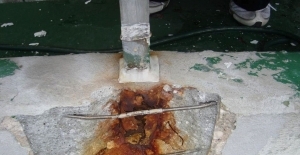 We know that the best guardrail anchoring systems will protect the concrete balcony slab from corrosion and spalling. Does the anchoring system involve a large 3″ to 4″ coring hole? We know that these larger cored holes for posts will cause major problems and at most a 2″ coring hole is ideal to protect the steel reinforcement/rebar inside the concrete from spalling. Does the rail permit condensate to drain through interior channels? We know that moisture should be channeled away from the building to prevent corrosion and spalling. Will moisture that drains end up inside the concrete? We know that standard mortars used to seal the cored concrete will eventually crack and lead to spalling. 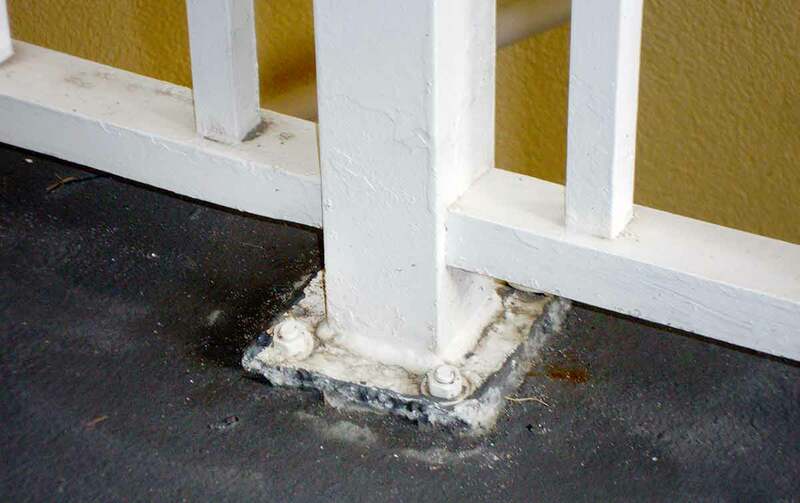 High-strength epoxy cements will protect the railing post anchor more than standard mortars. If a railing manufacturer or installer fails to answer these questions, you should think twice. You don’t want to end up with the same problems in ten years that required you to replace the rails in the first place. Carefully consider the merits of each available system and the future ramifications of the decisions made today.